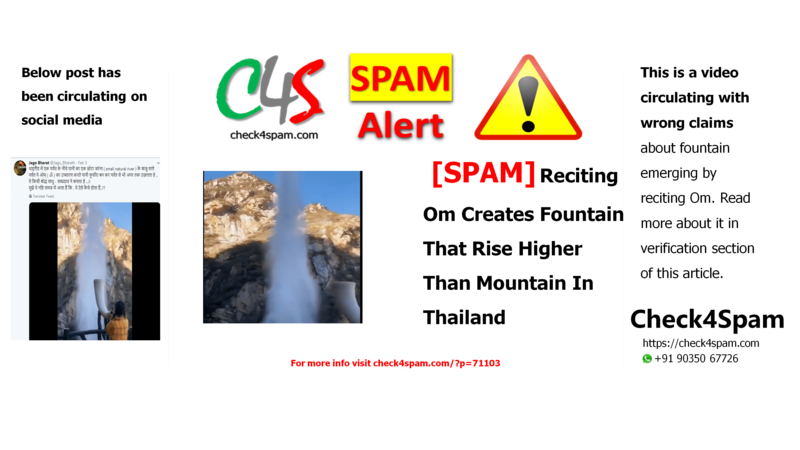 This video of emerging fountain by reciting om (ओम्) is circulating with false captions on social media. Please find more details in this article. “थाइलैंड में एक पर्वत के नीचे पानी का एक छोटा जरंना (small natural river) के बाजु वाले पर्वत पे *ओम् (ॐ)* का उच्चारण करते पानी फ़ूवाँरा बन कर पर्वत से भी अपर तक उछलता है….ये किसी साधु सम्प्रदाय ने बनाया है…. हमें ये नहि समज में आता है की ये एैसे कैसे होता है ? पानी का वज़न + गुरुत्वाकर्षण से भी इतना अपर पानी सिर्फ़ आवाज़ के तरंग से कैसे जा सकता है? ये कोई विज्ञानी ही बता सकता है…. उसे जान ने के लिए हमें बहुत जिज्ञासा है क्योंकि ऐसा सिर्फ़ *ओम् (ॐ)* बोल ने पर ही होता हे !! ये भी एक अजीबो अजूबा है. The video circulating on social media is very much real, but the captions that have been attached to the video is fake. The video is not from Thailand but from China. These fountains are not natural. They work on sounds. They are supplied by Himalaya Music Fountain corporation. They can be seen at many places in China including tourist spots such as the Thousand Buddha Caves in China, Gansu Province. Just because the claim is based on religious word ओम्, this video is shared left and right on various social platforms to show the bhakti in religion. It’s understood to have faith, but not blind faith. Don’t let these stakeholders of religion take you for ride on the name of religion. This is very easy way of making fool of people. Be careful, Check4Spam before believing and sharing such fake videos on the name of religion.